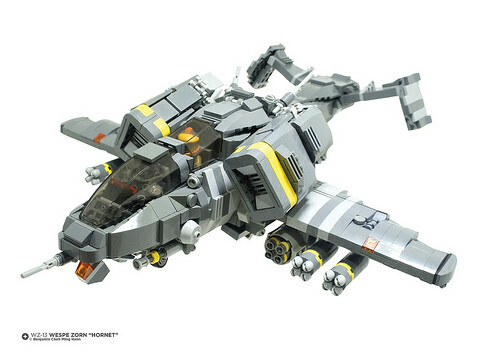 I wouldn’t mess with forces utilizing gunships designed by builder Benjamin Cheh Ming Hann. His aircraft, named “WZ-13 Wespe Zorn ‘Hornet'”, was influenced by the Messerschmitt BF 110 and the A-10 Thunderbolt. Both of these design inspirations come together well in a simple yet effective gray/yellow color scheme. I love those A-10 inspired thrusters and the dual cockpits seating both pilot and navigator. See the “Hornet” in more detail on Benjamin’s Flickr.